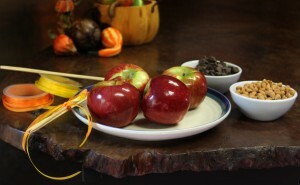 With a spoon pour enough of the chocolate liquid around the top of each apple so that it drizzles down the sides, repeat the process until you have the desired amount of chocolate. Combine 1/2 cup of Nestles Butterscotch Morsels and 1 tablespoon of milk in a sauce pan, cook on high, stirring continually until mixture is a liquid and repeat the drizzle process with the Butterscotch Liquid allowing it to drizzle on top of the chocolate. Refrigerate until chocolate and butterscotch is set. 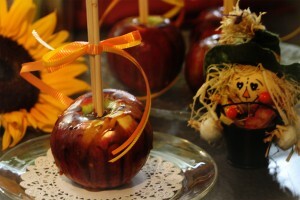 Tie festive colored ribbon around Popsicle sticks or wooden skewers and push into top of apple to make the handle. 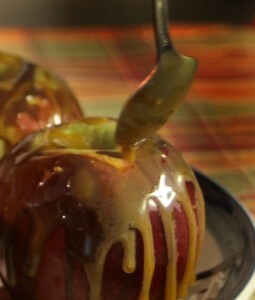 The less liquid you drizzle on the apples the less calories and the healthier the treat! Substitute Peanut butter or white chocolate morsels for the butterscotch. Substitute low fat or skim milk for milk.